Tate Modern is a converted former power station on the south bank of the River Thames. The cavernous spaces inside have been turned into one of the most impressive modern art galleries you’ll see anywhere in the world. Some of the building has been filled in with a series of floors linked by escalators and on each floor you’ll find a vast array of modern art. However, the most impressive exhibition area is the huge gallery that still offers floor to ceiling space and many large works have been hosted here over the years. The gallery also recently had a large extension constructed on the rear, some of it making use of the former circular tanks. We think it’s worth visiting just to see how the old building has been converted, but if you like your art, there’s plenty to challenge your thoughts inside too. Best of all, it’s free. The restaurant on the top floor is worth visiting too. 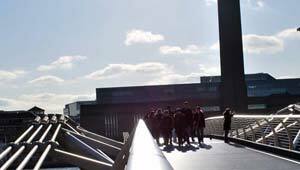 Tate Modern gets 4.6 million visitors a year which puts it in the top three UK tourist attractions. Tate Modern is open daily from Sunday to Thursday between 10am and 6pm and on Friday and Saturday between 10am and 10pm. Although entry is free, there are sometimes special exhibitions which are charged separately. If you like what you see here, try the Tate Britain which is further down the Thames past the Houses of Parliament. Tate Britain is also free. For a unique experience, try the Private Tour of Tate Modern & Tate Britain which is led by an art historian.